We offer corporate apparel for companies of all sizes. From the smallest company, to the largest corporation, we can create a custom order! 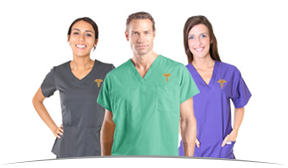 Do you need medical apparel? We can help with that too. Get in touch with us and let us know what you're looking for. We can do uniforms and more! If your sports team needs new uniforms, look no further. We can customize Nike, Adidas and many other brands of sports apparel. Psycho Jock is located in Scottsdale Arizona, but services clients all over the nation. We take a great deal of pride in our customer service and the high-quality products we offer. For needs as small as 1 hat, to 5,000 shirts we can help. Quick turn around? Look no further, we specialize in super fast delivery time. Just give us a call today at (480) 656-5629 or contact us online! The Psycho Jock team has stepped up to the plate for Guzzo Worldwide on multiple occasions, always delivering quality work and products along with providing amazing customer service. They have made our visions a reality better than we could have ever imagined. With many large, last minute orders Psycho Jock has never let us down. Thank you for your excellent work. We’re located in Scottsdale, Arizona, but we serve more than just this area. We carry a variety of brands: Nike, Adidas, Calvin Klein and more. And we can do everything from embroidery to screen printing to rhinestones. What kind of apparel do you need? Are you a church group, sports team, large business or something else? Call us today to see what we can do for you! We are full service Branding experts! From apparel to promotional items we handle almost anything.